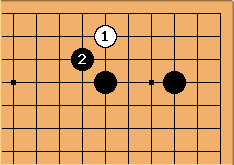 Black covers the corner to such a degree that an invasion there would generate a lot of thickness and would be hard to do which contributes to the idea behind the high moves - Influence. Classically speaking, this enclosure was the rarest of the four enclosures. 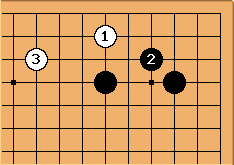 It does not appear in Essential Joseki, Enclosure Josekis, Ishida's Joseki Dictionary, Keshi and Uchikomi - Reduction and Invasion in Go, A Dictionary Of Modern Fuseki, The Korean Style or Kihon Fuseki Jiten. There is some discussion of this shimari in the Japanese book Shimari no Gihou (Shimari Techniques) by Ishida Yoshio 9p, published in 2002 by Kawade Shobou Shinsha, ISBN 4-309-26570-7. Now however, it has been popularized by AlphaGo choosing it in several games. a, b, c, d, e and f aim at removing the possibility of a moyo on the right. j is meant to use the get-under threat left by the high stone. Some discussion has been going on at 3-4 6-4 enclosure statistics. 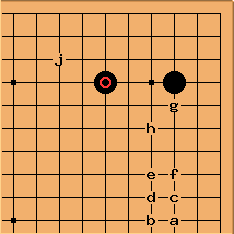 Bob McGuigan: In his book Shimari Gihou referenced above, Ishida Yoshio gives quite a bit of information about this shimari and how to play against it. It came to notice during the Shin Fuseki period but now is not widely played. However, it is coming back a little due to the present-day emphasis on speed. Ishida devotes some 60 diagrams to the analysis of this shimari. Speaking of strategy, Ishida feels that from Black's standpoint the timing of when and how to defend the corner territory is a difficult issue. 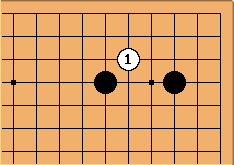 From White's perspective, helping Black solidify the corner territory is forbidden. White's goal is to exploit the weakness of Black's fourth line extension. Invading at in the following diagram is one idea. The most common response is followed by . This tends to lead to White living in the corner and Black building strength on the outside or facing the upper side. 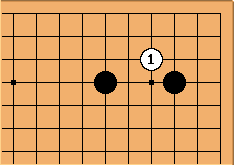 When to play these moves and which, if any, to choose depend on the overall position. Each of the above moves leads to many variations.